DO-20250-16 was succesfully added to your cart. The Digi-Sense hot-wire thermoanemometer is designed for precision air velocity and airflow measurements in seven user-selectable units (ft/min, m/s, mph, km/h, knots, CFM, or CMM). The instrument will help you meet cooling and environmental requirements for safety and comfort, as well as assure proper ventilation and filtration in cleanrooms and fume hoods. 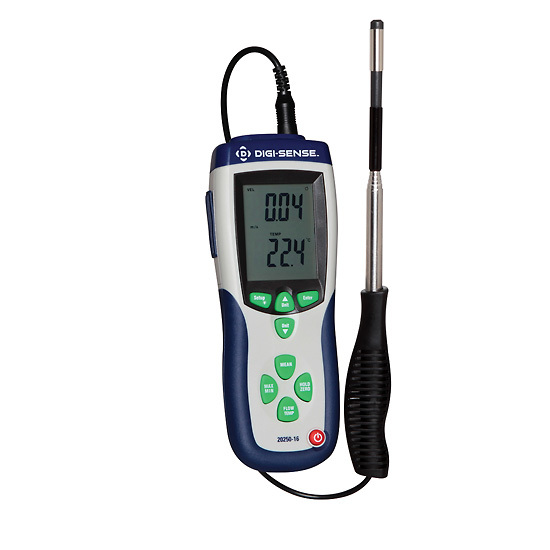 The large dual display allows you to simultaneously read air velocity or airflow and air temperature and shows real time, maximum, minimum, and average values for the parameters under investigation. Slim telescopic probe is designed to reach into small openings. The handheld hot-wire anemometer permits single point measurements or average measurements taken over a given time period. Comes in a foam-cut hard carrying case to protect the instrument between uses. Includes software and USB cable to download measurements into a PC for analysis and storage. Low-battery indicator prompts battery replacement, preventing power loss. telescoping hot-wire probe sensor with cable, USB cable, software CD, hard carrying case, AC/DC power adapter, one 9 V battery, and NIST-traceable calibration report with data supplied by InnoCal. Dimensions 8-1/4" x 3" x 2"
Is this product suitable for measuring airflow on a downdraft bench? It could work, but the sensor might be on the smaller side for your application. This system is designed to take airflow mostly in pipes and vents. Will this work in 3" pvc pipe ducting? The probe diameter is 3/8". It will measure air flow in a 3" PVC pipe. Hello. Does the calibration certificate for this instrument complies with the standard ISO-17025? Yes, the unit is calibrated by an ISO 17025 calibration lab. How long is the telescopic probe extend to? Extend the telescoping probe to your desired length, up to 41"/104 cm. what is the probe diameter for the hot wire anemometer? The probe diameter is 3/8". In setting up our 20250-16 I've noticed the graphic on the PC or Laptop remains in Metric units even though I previously made the setup change to english on the handheld meter. What steps did I miss or is there a rev needed in the Software ? The left side graphic image correctly duplicates the handheld. However the table at the bottom remains in metric. I have the same problem. The software reads the handheld display correctly, but the software units cannot be changed from metric to English; I want to measure face velocity in ft/min. Part of the problem may be that there is no manual for the software. Maybe if there were some simple instructions in the Help menu rather than a useless splash screen we would be posting this question. I just bought the meter and the software is the current Ver. 6.0. A pdf software manual would be helpful. The current software download can be found in the Technical Resources section of the product page. The units that the software is stating before export to excel will be the units transferred to the excel document. I need to measure flow that may be either entering or exiting a very small, roughly 4 in^2, duct. Will this meter measure flow in either direction? I only have access to one side of this duct. Yes, this probe can measure flow in either direction. Does this unit report Standard Airflow (SCFM) or Actual Airflow? What is the range specs for the velocity in fpm? What is the minimum fpm? Thanks! The air velocity range is 20 to 4925 ft/min. Merchant response: Your unit may need to be re calibrated and adjusted, so the readings will remain accurate. The unit can be sent to our lab for re calibration. Please call the number at the top of the page, to set up a calibration. Works well, but is it durable? Ordered two of these. Easy to use, good performance for the money, NIST traceable, comes with data capture software... What's not to like? Well, after about 45min of use, one of them lost the ability to run off of the battery. It still worked from the AC adapter, but that's no good for field use. I poked around a bit and it's a board-level problem. Has now been replaced under warranty, but it doesn't inspire much confidence. Also, the AC adapter provided does not work with US plugs. Seems right for Europe, or maybe Japan, but domestic use requires a travel-style adapter. What were they thinking? Finally, the data logging software provided works nicely, but they only provide a PC version. My students can't do any fieldwork with their Macbooks.